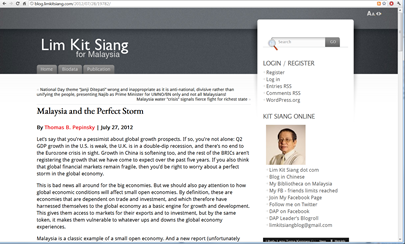 My last post, Malaysia and the Perfect Storm, attracted some attention from the Malaysian blogosphere. Most notably, it was reproduced in its entirety on the blog of Lim Kit Siang, long the elder statement of the opposition Democratic Action Party. From there, it bounced around the Malaysian twitterverse a bit too. I am flattered by this. However, I do not support the way that my post was appropriated by the LKS blog. When you look at the entry, it’s almost impossible not to get the impression that I wrote this post for LKS. That of course is the wrong impression to get. You also do not see the original links in my post, which provide important context to some of the statements that I make there. You can click on my name and see that the post was originally made here at Indolaysia. But it’s not obvious to your casual visitor that this is a wholescale reproduction of a post that I made somewhere else, not something that I wrote for Lim Kit Siang’s blog, which is important because it would suggest an implicit endorsement of him or his party’s program. As a foreign observer, I am unwilling to make such an endorsement of any Malaysian politician or political party. I would not have written the post in the way that I did had I been writing for LKS’s blog by invitation. Beyond these awkward political considerations, I think that it’s just generally poor taste—bad blog etiquette, I guess—when blogs fail to link in a transparent fashion. (I thought that linking etiquette had been settled back in the early 2000s.) In fact, readers of the LKS blog will never know that I maintain a Indolaysia, which they might find interesting, unless they happen to mouse over my name. I’ve written a short note to the LKS blogmaster to that effect. UPDATE: Kudos to the Lim Kit Siang blog for a quick fix. Now go and check it out for a great collection of contemporary writings on Malaysia.